A corporate gift that was unused and is like new. A bargain on this new watch. 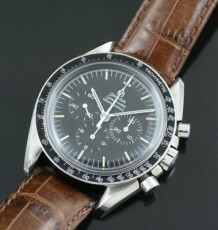 This is one of the watches that has a presence way beyond its actual value. 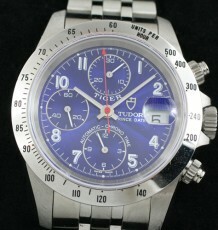 The Tissot brand is owned by the SMH group that also owns Omega, Blancpain and Breguet. This watch features a high precision quartz Chronograph movement in a solid and substantial steel case fitted with a scratch-resistant sapphire crystal. 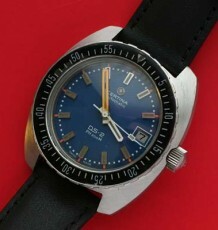 The watch also comes with a solid steel bracelet that still has plastic covering the fliplock clasp. The high contrast steel hands on the black background of the dial makes reading the watch delightfully easy. The watch measures 40 mm wide, the same size as a Rolex Submariner, and is listed as being water resistant to 200 metres or 660 feet. The watch is as new and unworn. It was a corporate gift that was not engraved and was never worn. 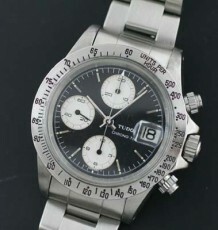 An ideal opportunity to buy a complete and like new Swiss Chronograph watch at a steal. 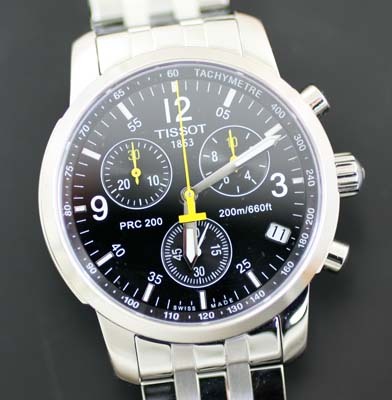 SKU: 561 Category: Tissot Tags: Blancpain, Breguet, chronograph, gift watches., gift weatches, Omega, Rolex Submariner, SMH, swiss watch, Tissot watches, waterproof.